The smugness of this speculator in railroad stocks is palpable. Bedizened with gaudy jewelry, sporting a bad comb-over and an insufferable smirk, he puffs out his chest and doesn’t even deign to look at the “Sales at the STOCK EXCHANGE” bulletin on the day’s trading he holds in his left hand. During the 1840s in the U.S., merchants and other members of the middle class began trading stocks avidly, and the first guidebooks about speculating on Wall Street were published. Railroads, developed in the 1830s, were the growth stocks of the day, and a huge boom in their shares in England was echoed in the U.S. Even after the boom collapsed in the mid-1840s, speculators continued to trade actively. The most popular railroad shares were called “fancy stocks,” trading at huge multiples of their earnings and with enormous volatility that often wiped out amateur speculators. In the companion piece to “Stocks Up,” the despair of this speculator is obvious. During the 1840s in the U.S., merchants and other members of the middle class began trading stocks widely, and the first guidebooks about speculating on Wall Street were published. The most popular railroad shares were called “fancy stocks,” trading at huge multiples of their earnings and with enormous volatility that often wiped out amateur speculators. In his frustration and fury, this trader crushes in his hand a pamphlet called “The Art of Making a Fortune in 2 Hours.” (Such tout sheets were common then, and some things never change.) Among the stocks named in the recommended list are the Farmers’ Loan and Trust Co., among the first U.S. banks to get in over its head on real-estate lending; Harlem Rail Road, a company whose stock was constantly manipulated by the takeover artists of the day who struggled to take corporate control; Norwich and Worcester, the volatile railroad stock once “cornered” by the major brokerage of Jacob Little & Co.; the Reading Rail Road Co., a pet stock of Nicholas Biddle, the manipulative financier who had run the Second Bank of the United States into the ground; Stonington Rail Road Co., a Connecticut train line controlled by Cornelius Vanderbilt; “Vicksburgh,” a railroad-and-banking company based in Mississippi that had gone bust; and the Morris Canal and Banking Co., which wags nicknamed “the Morrison Kennel” because it was such a dog. “Fortunes have been lost and won upon its fluctuations,” William Armstrong wrote about Morris in 1848. Hogarth was the greatest — and most popular — engraver in early 18th-century England. After the South Sea Bubble collapsed in 1720, he viciously mocked the stock-market fever that had gripped London and ultimately wiped out countless speculators. Under a turbulent sky full of whirling clouds, a crowd hauls a giant wooden lever that turns a creaking merry-go-round, where speculators from all walks of life straddle horses shaped like phalluses. At the left, the Devil spews flaming venom from his mouth as the huge crowd hangs on his every word. Like a butcher dispensing cuts of meat, the Devil is hacking the body of Fortune, goddess of wealth and luck, to bits and throwing her dismembered limbs to the crowd. A Quaker holds open a sack to catch a shower of money that never comes, while a dwarf picks the pocket of a schoolteacher. Away from the mob, a man of “Honour” is flogged at a whipping post by “Vilany,” assisted by an ape in devilishly flamboyant garb, while the figure of “Honesty,” stripped naked, is bludgeoned by “Self Interest” atop a wheel of fortune as a minister intones a prayer over him. Behind the whipping post, the wooden stocks into which criminals should be pinioned for punishment are empty and shut with a conspicuously dangling padlock. The gambling spirit has infected everything: The balcony at top left is teeming with women lined up to enter an office under a sign that reads “Raffleing for Husbands with Lottery Fortunes in Here.” Hogarth suggests that the damage from speculation may be irreversible: Jackals slink over the monument “erected in memory of the destruction of this city by the South Sea,” while the goddess of Trade (legitimate industry), hollow-eyed and clothed in rags, cowers in the lowest corner, starving in the dark. To all Blue Aprons in the Town. Guess at the Rest you find out more. The stock market had returned more than 16% in both 1897 and 1898, and people from all walks of life were clamoring for quick profits on Wall Street. A crowd of speculators, including a minister and a widow still wearing her mourning clothes, fling money into the promoter’s outstretched butterfly net; some are running at a full sprint, and their stampeding feet raise a cloud of dust. 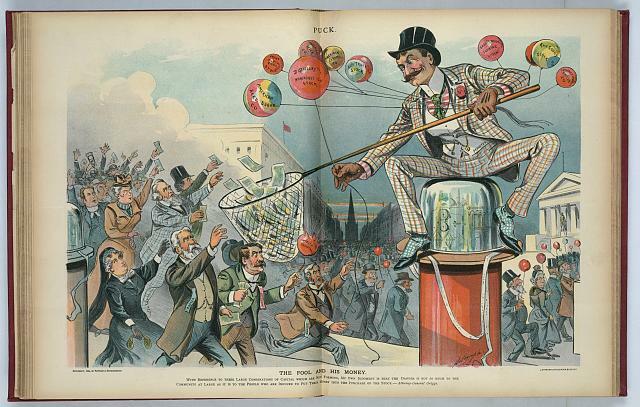 One speculator holds a balloon labeled “INFLATED INDUSTRIALS,” which bursts and blows his top hat off. In the ominously dark sunset at the center, the spire of Trinity Church at the western end of Wall Street stands poised like a needle, ready to pop any of the balloons that drift its way. We stand in a main street of Bruges, the richest city in Renaissance Flanders (now Belgium), looking into a goldsmith’s stall. A mirror reflecting a view of the street, and showing others peeking in, reminds us that wealth was very much a public affair even then. Not just gold but many objects of precious coral — believed to ward off the evil eye and, thus, to preserve wealth — line the shop. The goldsmith, dressed in a simple scarlet robe that evokes the Passion of Christ, is in stark contrast to the ravishingly dressed couple he is fitting for wedding jewelry. He was long believed to represent St. Eligius (also known as St. Eloy or St. Loy), who converted Flanders to Catholicism in the 7th Century and, as a miraculously talented metalworker, became the patron saint of goldsmiths. After working in the royal court with gold and precious stones in his youth, St. Eligius took a vow of poverty and devoted the rest of his life to helping the poor, so his presence here would remind the painting’s original viewers that the sole purpose of wealth was to serve God. 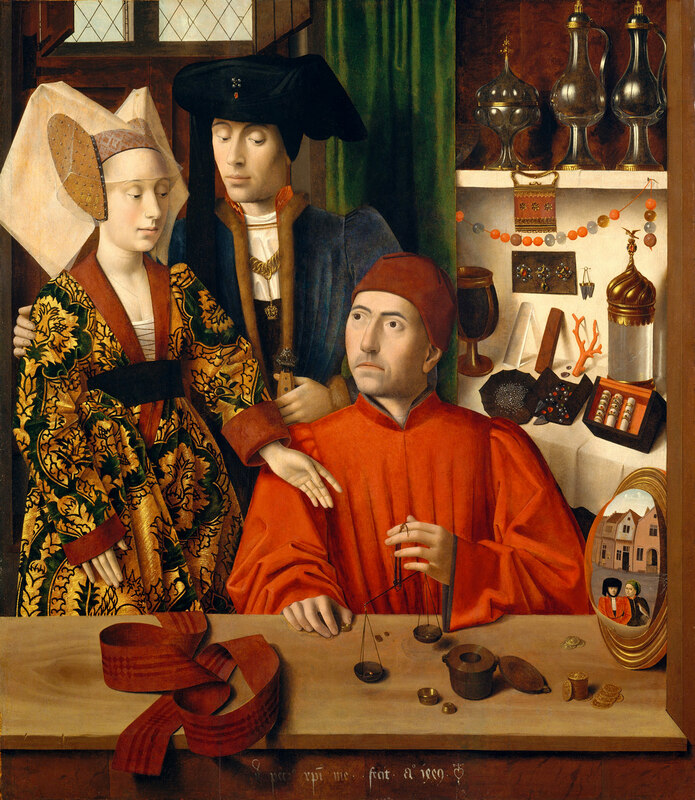 More recent scholarship argues that the goldsmith portrayed here was not a saint but rather Willem van Vleuten, a local artisan in the service of Philip the Good, the Duke of Burgundy who patronized the greatest artists of Flanders. But there is a twist: Unlike the famous angel who uses his right hand to carry the scales of justice in Rogier van der Weyden’s great altarpiece “The Last Judgment,” painted a few years earlier, here the goldsmith holds the pan balance in his left (sinistra) hand to symbolize that profane rather than sacred matters are being weighed. In fact, the picture is full of dramatic tension: With one firm hand, the groom urges his bride forward while he clutches the hilt of his sword with the other — as if he means to drive a hard bargain, with force if necessary. And the bride reaches for the ring before the goldsmith, scowling at their haste, has been able to finish weighing it to calculate a price. Or, perhaps, she is even grabbing for the pan balance herself, as if she doesn’t trust his valuation. We can almost hear the clink as a pile of gold coins at the far right of the window sill collapses like a tower built too high. The painting thus tells a cautionary tale, warning that riches can corrupt and that spiritual wealth is rarer and more precious than worldly wealth. This allegory depicts the punishment of greed. At the left side of the image shown here, a miser crouches bestially on his haunches. His arms are stretched out, as if on a torture rack, by the weight of two bulging sacks of coins that seem as heavy as bowling balls. Screaming and sneering at the same time, he’s being hauled up by the hair, torn away from his money by the angelic figure with a rod who stands behind him. Two eagles, which symbolize St. John the evangelist and the Gospel itself, bracket the scene. If a fool and his money are soon parted, this image is an eternal reminder that the greedy and their money are painfully parted. This dazzling image is probably based on a lost painting (formerly in Milan) by Jan van Eyck (ca. 1390-1441), one of the most powerful early representations of money-handling in European art. Here, religious devotion and mundane wealth are set side-by-side. Through a door left ajar, two men in the back room haggle over a trade. The banker — probably an Italian running a Flemish branch of one of the great Florentine banks — painstakingly weighs and counts a small fortune in gold. The banker bows his head over his pile of wealth in rapt fixation; he looks as if he is praying to, or for, the money. His wife, apparently distracted by the clinking of the coins, looks up from her devotions to the Book of Hours; as she gazes away from the image of Mary holding the infant Jesus, her face almost seems to have the sadness of sin. Thus the banker, engaged in the profane task of handling money, seems to be prayerful, while his wife, ostensibly in the midst of the sacred duty of prayer, appears to be daydreaming about the world of wealth. These two people, personifying the sacred and the profane, lean gently in toward each other, reminding us that in this era religion and business had already become inseparable. His left hand and hers are poised in almost identical positions, but hers touches the prayer book so gently that the page stands captured in the air, while his weighs a coin and a piece of jewelry in a pan balance that hovers tensely and casts pitch-black shadows onto the counter. His right hand grips a coin with all the reverence that a priest would reserve for holding the Eucharistic wafer during communion, while hers rumples an unread page of her prayer book, pushing it in the wrong direction for someone who is reading from right to left. Directly over the banker’s head, an apple — symbol of the fall of an earlier couple, Adam and Eve — sits on a shelf, while the world that generated the banker’s wealth peeks in through a shutter in the back and is reflected in a mirror in the foreground. This image brilliantly portrays the tension between the Christian virtues of poverty and humility, on the one hand, and the Dutch and Flemish passion for financial capitalism on the other. In Holland and Flanders, sea-level nations that lived in perpetual danger of being washed away by the waters of the North Sea, the struggle for wealth became indistinguishable from the struggle for survival. Like the ancient Hebrews, the Dutch regarded themselves as a chosen people who had survived an epic flood — and were riven with guilt at not only surviving but thriving. This painting aches with that ambivalence about wealth. In a cramped chamber decorated with marquetry panels, the older man on the left is calmly recording entries in a tax register, which lists the duties owed on goods like beer, wine, and fish. The younger man on the right, however, is the one who grabs our attention. His bright blue eyes stare straight at us out of a face that is part repulsively demented, part ridiculously comic. He seems to have burst into the room through the open door, toppling the papers and seals from the shelf behind him as he dives for the money on the table. The coins, which were arrayed in neatly sorted stacks of silver and gold, have spilled away at the mere approach of his grasping claw, symbolizing the way wealth so often escapes us when we get too greedy and grab for it too soon. This cosmopolitan trader must have asked Holbein to make him seem as thoughtful and cultured as possible in this wedding portrait. Books of various sizes litter his workspace, and the carnations (or “pinks”) that symbolize betrothal dominate the foreground and blaze against his black waistcoat. His desk is covered with an Ushak rug imported from Turkey. An intricate brass desk-clock, a reminder that time is fleeting, stands next to the delicate Venetian blown-glass vase that holds the flowers; coins, the symbol of Gisze’s wealth, are shown off to one side, an apparent afterthought idly heaped in a pewter dish with its lid askew. Scratched on the wall at the upper left is Gisze’s personal motto, “Nulla sine merore voluptas” (“There is no pleasure unmixed with sorrow.”) Seeming to float almost like the moon in a night sky, an ornately decorated string dispenser hangs from the shelf on the right. Gisze’s bride must have been enchanted with this portrait, which remains one of the most humane and intriguing pictures of a businessman ever made. Here, the great draftsman Daumier captures the comic dialogue between a fraudster and his victim with cinematic accuracy. The result was ferocious competition among brokers to obtain new clients by any means possible. There was a crash in 1837, but by the following year, speculation was running wild again on the Paris Bourse. A tontine is a combination of insurance coverage and an investment scheme in which the last surviving member of the original pool of investors can claim the returns. Daumier’s reckless speculator of the 1830s, Mr. Gogo, is thus the direct ancestor of the swashbuckling fund managers of the 1960s described in John Brooks’ classic book, The Go-Go Years, published in 1973. As Benjamin Graham was fond of saying, Le plus ça change, le plus c’est la même chose. Fortuna was the Roman goddess of wealth — and of luck. In the ancient world and in medieval Europe, fortune stood simultaneously for wealth and luck. Riches were understood to be largely the result of luck, and luck was the substrate of wealth. As a result, money was regarded as ephemeral. Your fortune was effectively on loan to you from the goddess Fortuna, who could call her property back from you at any time and without warning. The Wheel of Fortune was indistinguishable from the Circle of Life. 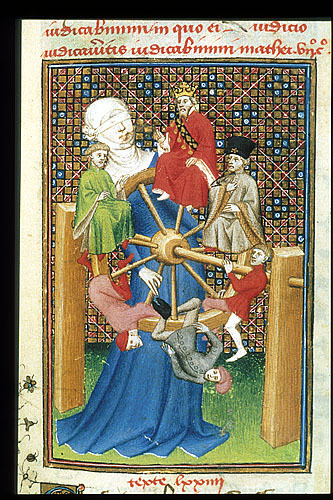 This illumination shows the fickle goddess spinning her wheel counter-clockwise toward the left (sinistra in Latin), symbolizing the evil turn that her judgments so often took. The wooden wheel may well be a replica of the mechanical wheels that carpenters constructed for medieval dramas about Fortuna performed on stage. In royal blue robes and nearly triple the size of the mortals she manipulates, the giant goddess wears a strap over her eyes and ears, making herself blind to favoritism and deaf to entreaties for mercy. As she cranks her wheel, men from all walks of life — various workmen, a religious scholar, a wealthy merchant, a king — flatter themselves into believing that they will be secure at the top, only to topple on their inevitable swing to the bottom. In many such images, the king calls out “I will reign” from the ascending side of the wheel, “I reign” at the top, “I have reigned” on the way down, and “I have no reign” at the bottom. Our modern idiom “to come full circle” is a vestige of this ancient idea, as is the word revolution, referring to an especially sudden turn of Fortuna’s wheel. Almost two centuries before the French Revolution, Callot captured the misery of life at the bottom of France’s social ladder. The beggar in Callot’s etching hobbles along on painfully splayed feet (perhaps as a result of rickets, the dietary disease that results from a lack of Vitamin D). And yet, even with his feet grotesquely twisted and his clothes in shreds, the man’s face has the fierce dignity of Michelangelo’s Moses. The fact that Callot’s prints were enthusiastically collected by the wealthy only adds irony to the sympathy that he so clearly felt for the man he portrays here. The rich man attempting to squeeze through would fit easily, but the pouches of money that ring his waist like a belt are ensnared on the frame of the gate. In his right hand he holds an enormous geldbeurs or handled sack, often called a talon purse, that can’t possibly fit through the door alongside him. All the man has to do to gain entry to heaven is to remove the pouches from his waist and drop the talon purse, but he won’t do it. He stares directly at us with pleading eyes, as if to say: I know I can’t take it with me, and I know you know that, and I know that you know I know that, but I want to anyway. If I can’t get in without the money, I’m going to keep pushing like this for all eternity. To us today, the shape of the man’s purse seems almost shockingly phallic. However, these purses were common in 16th and 17th century Holland and Belgium, carried by men and women alike. Their suggestive shape was probably no accident, and many artists of the time played up the rampant form of the handle and the swollen, scrotal shape of the sacks attached to it. See here, for example… …or here, in which a lustful man gets robbed as the woman he is fondling grabs his anatomically suggestive purse: . So the rich man at heaven’s gate, in clinging to his money bag, shows that it isn’t just gold he can’t bear to leave behind, but the pleasures of the flesh that it can buy. Directly behind him, the arm of an unseen angel lowers a giant sewing needle from the sky. The camel stares at it and brays in disbelief that his handlers expect him to try to fit through its narrow hole. Two men in scholars’ robes prod the camel with staffs, while an honest workman leads on his spade and shoves the camel from behind. In this series of images, “The Miserable Lot of the Rich,” van Heemskerck may have been commemorating a symbolic parade or theatrical procession that had recently been staged in a town square at Antwerp or Haarlem or another major commercial town. Such public allegories of morality were a common form of didactic entertainment at the time. For it is easier for a camel to go through a needle’s eye, than for a rich man to enter into the kingdom of God. It is likely that van Heemskerck wanted the striving Dutch and Flemish art patrons of his time to remember that, even according to Jesus, some rich people may be regarded as righteous after all, regardless of how much money they have, so long as they do good with it. The mysterious Dubreuil, one of the greatest American masters of trompe l’oeil, or “fool-the-eye,” painting, taunts us with textures. He captures, in seemingly microscopic detail, the grain of the pine boards to which the $5 bill is sloppily glued. We can easily detect — almost feel in our fingertips — the hand-planed, tapering edges of the boards and the various scratches, stains and dings that mar the surface of the wood. Then Dubreuil mocks us by painting the $5 bill in less detail, as if he can’t quite be bothered to reach for his magnifying glass to get every bit of engraved filigree precisely right. He even makes the shadow cast by the bill impossibly darker on the right board than it is on the left, daring us to notice. Dubreuil knows perfectly well that even though the money looks fuzzy and unreal against the phenomenally detailed background, it still makes us try to grasp it and pull it off the canvas. He suggests that money has a kind of psychological reality that surpasses the power of the most exact replica of reality. We can almost hear him laughing as we stare at his painting, our palms itching and our fingers twitching. When, in the year 2000, Henry Blodget, then an analyst covering technology stocks for Merrill Lynch, referred to some of the companies he followed as “a piece of crap” and “POS” [piece of sh*t], he was following in the footsteps trail-blazed by the Dutch 280 years earlier. A modern viewer of this plate can’t help noticing that the checkerboard pattern of the clown’s pants and the tile floor foreshadow the grids of stock-market charts. Nor can we avoid wondering: Were the original purchasers of these plates people who had prudently refused to participate in the bubble and were now laughing at the folly of others? Or were the plates bought by victims of the bubble to “eat crow” from, as a daily reminder of their own foolishness? Unless he gets full Cent per Cent. This image evokes the trope of the miser or moneylender counting his “store” of coins, one of the most popular themes in Dutch art of the 17th century. By showing an aged and exotically dressed man fondling his money, the Dutch — and here, by extension, the British — were able, at one and the same time, both to mock and admire the love of wealth. The engraving seems to challenge the viewer: Of course, you would never behave like this, would you now? As the poem tells us, Mr. Gripus — get it? he grips us in his greedy clutches — will charge up to 100% for short-term loans (“full Cent per Cent”). He is simultaneously absurd and dignified. Mr. Gripus, who would squeeze his debtors to death, caresses his money bags with exquisite gentleness and stares as lovingly at them as if they were his newborn children. But there is also dignity in his quiet, contemplative pose, and his velvet robes and tasselled cap seem to glow with a light that comes from within. With his first name of Israel, his luxuriant beard and his hooked nose, he is meant to be seen as a Jew, although he is shown in the tradition of Rembrandt’s sensitive portraits of Jews rather than the vicious caricatures prevalent among other European artists. Do you have favorites of your own? Send your suggestions to info@jasonzweig.com .